Canyon High School - Ovid's "Daedalus and Icarus"
His parentage was supplied as a later addition to the mythos, providing him with a father in Metion, Eupalamus, or Palamaon, and a mother, Alcippe, Iphinoe, or Phrasmede. Daedalus had two sons: Icarus and Iapyx, along with a nephew either Talus or Perdix. Athenians transferred Cretan Daedalus to make him Athenian-born, the grandson of the ancient king Erechtheus, claiming that Daedalus fled to Crete after killing his nephew Talos. Over time, other stories were told of Daedalus. Daedalus is first mentioned by Homer as the creator of a wide dancing-ground for Ariadne. He also created the Labyrinth on Crete, in which the Minotaur (part man, part bull) was kept. In the story of the labyrinth as told by the Hellenes, the Athenian hero Theseus is challenged to kill the Minotaur, finding his way with the help of Ariadne's thread. Daedalus' appearance in Homer is in an extended metaphor, "plainly not Homer's invention", Robin Lane Fox observes: "He is a point of comparison and so he belongs in stories which Homer's audience already recognized." In Bronze Age Crete, an inscription da-da-re-jo-de has been read as referring to a place at Knossos, and a place of worship. In Homer's language, daidala refers to finely crafted objects. They are mostly objects of armor, but fine bowls and furnishings are also daidala, and on one occasion so are the "bronze-working" of "clasps, twisted brooches, earrings and necklaces" made by Hephaestus while cared for in secret by the goddesses of the sea. Ignoring Homer, later writers envisaged the Labyrinth as an edifice rather than a single dancing path to the center and out again, and gave it numberless winding passages and turns that opened into one another, seeming to have neither beginning nor end. Ovid, in his Metamorphoses, suggests that Daedalus constructed the Labyrinth so cunningly that he himself could barely escape it after he built it. Daedalus built the labyrinth for King Minos, who needed it to imprison his wife's son the Minotaur. The story is told that Poseidon had given a white bull to Minos so that he might use it as a sacrifice. Instead, Minos kept it for himself; and in revenge, Poseidon, with the help of Aphrodite, made Pasiphaë, King Minos's wife, lust for the bull  For Pasiphaë, as Greek mythologers interpreted it, Daedalus also built a wooden cow so she could mate with the bull, for the Greeks imagined the Minoan bull of the sun to be an actual, earthly bull, the slaying of which later required a heroic effort by Theseus. This story thus encourages others to consider the long-term consequences of their own inventions with great care, lest those inventions do more harm than good. As in the tale of Icarus' wings, Daedalus is portrayed assisting in the creation of something that has subsequent negative consequences, in this case with his creation of the monstrous Minotaur's almost impenetrable Labyrinth, which made slaying the beast an endeavour of legendary difficulty. The most familiar literary telling explaining Daedalus' wings is a late one, that of Ovid: in his Metamorphoses (VIII:183–235) Daedalus was shut up in a tower to prevent the knowledge of his Labyrinth from spreading to the public. He could not leave Crete by sea, as the king kept a strict watch on all vessels, permitting none to sail without being carefully searched. Since Minos controlled the land and sea routes, Daedalus set to work to fabricate wings for himself and his young son Icarus. He tied feathers together, from smallest to largest so as to form an increasing surface. He secured the feathers at their midpoints with string and at their bases with wax, and gave the whole a gentle curvature like the wings of a bird. When the work was done, the artist, waving his wings, found himself buoyed upward and hung suspended, poising himself on the beaten air. He next equipped his son in the same manner, and taught him how to fly. When both were prepared for flight, Daedalus warned Icarus not to fly too high, because the heat of the sun would melt the wax, nor too low, because the sea foam would soak the feathers. They had passed Samos, Delos and Lebynthos by the time the boy, forgetting himself, began to soar upward toward the sun. The blazing sun softened the wax that held the feathers together and they came off. Icarus quickly fell in the sea and drowned. His father cried, bitterly lamenting his own arts, and called the land near the place where Icarus fell into the ocean Icaria in memory of his child. Some time later, the goddess Athena visited Daedalus and gave him wings, telling him to fly like a god. An early image of winged Daedalus appears on an Etruscan jug of ca 630 BC found at Cerveteri, where a winged figure captioned Taitale appears on one side of the vessel, paired on the other side, uniquely, with Metaia, Medea: "its linking of these two mythical figures is unparalleled," Robin Lane Fox observes: "The link was probably based on their wondrous, miraculous art. Magically, Daedalus could fly, and magically Medea was able to rejuvenate the old (the scene on the jug seems to show her doing just this)". The image of Daedalus demonstrates that he was already well known in the West. Further to the west Daedalus arrived safely in Sicily, in the care of King Cocalus of Kamikos on the island's south coast; there Daedalus built a temple to Apollo, and hung up his wings, an offering to the god. In an invention of Virgil (Aeneid VI), Daedalus flies to Cumae and founds his temple there, rather than in Sicily; long afterward Aeneas confronts the sculpted golden doors of the temple. Minos, meanwhile, searched for Daedalus by traveling from city to city asking a riddle. He presented a spiral seashell and asked for a string to be run through it. When he reached Kamikos, King Cocalus, knowing Daedalus would be able to solve the riddle, privately fetched the old man to him. He tied the string to an ant which, lured by a drop of honey at one end, walked through the seashell stringing it all the way through. Minos then knew Daedalus was in the court of King Cocalus and demanded he be handed over. Cocalus managed to convince Minos to take a bath first, where Cocalus' daughters killed Minos. In some versions, Daedalus himself poured boiling water on Minos and killed him. The anecdotes are literary and late; however, in the founding tales of the Greek colony of Gela, founded in the 680s on the southwest coast of Sicily, a tradition was preserved that the Greeks had seized cult images wrought by Daedalus from their local predecessors, the Sicani. Daedalus was so proud of his achievements that he could not bear the idea of a rival. His sister had placed her son, named variously as Perdix, Talus, or Calos, under his charge to be taught the mechanical arts. He was an art scholar and showed striking evidence of ingenuity. Walking on the seashore, he picked up the spine of a fish. According to Ovid, imitating it, he took a piece of iron and notched it on the edge, and thus invented the saw. He put two pieces of iron together, connecting them at one end with a rivet, and sharpening the other ends, and made a pair of compasses. Daedalus was so envious of his nephew's accomplishments that he took an opportunity and caused him to fall from the Acropolis. Athena turned Perdix into a partridge and left a scar that looked like a partridge on Daedalus' right shoulder and Daedalus left Athens due to this. Such anecdotal details as these were embroideries upon the reputation of Daedalus as an innovator in many arts. In Pliny's Natural History (7.198) he is credited with inventing carpentry "and with it the saw, axe, plumb-line, drill, glue, and isinglass". Pausanias, in travelling around Greece, attributed to Daedalus numerous archaic wooden cult figures (see xoana) that impressed him: "All the works of this artist, though somewhat uncouth to look at, nevertheless have a touch of the divine in them." It is said he first conceived masts and sails for ships for the navy of Minos. He is said to have carved statues so well they looked as if alive; even possessing self-motion. They would have escaped if not for the chain that bound them to the wall. 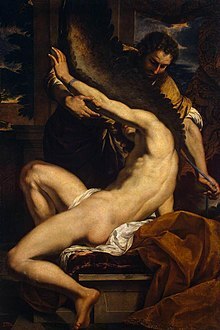 In the period of Romanticism, Daedalus came to denote the classic artist, a skilled mature craftsman, while Icarus symbolized the romantic artist, whose impetuous, passionate and rebellious nature, as well as his defiance of formal aesthetic and social conventions, may ultimately prove to be self-destructive. Stephen Dedalus, in Joyce's Portrait of the Artist as a Young Man envisages his future artist-self "a winged form flying above the waves ... a hawk-like man flying sunward above the sea, a prophecy of the end he had been born to serve”.